The Sierra Nevada Estate Homegrown Ale pours up with a nice head and copper color. The aroma is full of rich hoppy goodness. A little pine and citrus are the main aromas. The taste is starts with a hoppy bitterness turning to a malt mixed with hops bitters. Overall, Sierra Nevada Estate Homegrown Ale is a very tasty fresh hop organic beer with a 6.7% ABV. 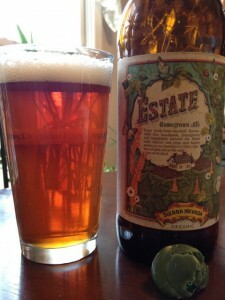 This entry was posted in Brews and tagged Sierra Nevada by Brian Allen. Bookmark the permalink.